Eileen Elias Freeman said in her Angels’ Little Instruction Book, “Angels are all around us, all the time, in the very air we breathe”. Many of us imagine angels as beautiful beings of light guiding us through lives often fraught with challenges. We are drawn to them. We write books about them produce films and shows, paint pictures, may be because deep down we know they love us no matter what we do and want to assist us. A drug addict called Andy collapsed. As he lay on the ground fighting for his life he promised he would never do drugs again. It was then he saw seven Angels whirling around his feet and chest. He was told he would be saved because in the future he would paint angels. Nearly 20 years later Lakey has become a well-known artist, famous for his Angel portraits and pictures. So you see Angels can help, but before we tell you how, let us ask you these three questions. Do you believe that our universe and life itself is multi-dimensional? Do you believe angelic beings guide and protect humanity? 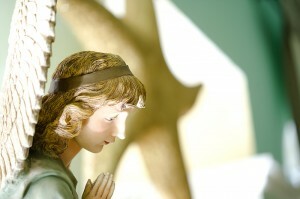 Do you think you could contact your Guardian Angel and transform your life as a result? If you answer yes to two of these questions you are open to talking to your Angel. You know, an Angel can only intervene through direct request, or when your life is in danger as per Lakey. But if you do decide to make contact be sure an answer will come. Angels will appear in your dreams or communicate through nature. You might find a multi coloured Butterfly settles on you when we feel depressed. You could see a Hawk in the city or a Fox in your back yard as a sign of positive change. A book drops from a shelf and you open it on the page with a comforting message. You might switch on the radio and the words of a beautiful song relieves your love concerns. You might be chatting to a taxi driver and he gives you the right idea to overcome a career or financial obstacle. A little old lady at a bus stop lifts up your morale with her sweet personality, a beautiful baby grins at you, making you smile when you feel sick of life. Synchronistical messages unfold when we ask for guidance, and look for it, and they happen miraculously. So how do we contact these beautiful beings? Put on music that inspires you. Light incense or burn Aromatherapy oils – Angels love Jasmine. Light a White candle, take a deep breath and say a prayer before asking for an answer to your problem. Visualize golden light filling your head, throat and heart, descending through your feet and growing roots into the ground, protecting your Aura and your life. Breathe into it deeply. When you feel ready, imagine a closed door opening and a colour pouring through it, the colour of your Angel. Imagine that colour flowing through the top of your head into your heart, healing your mind, your body and balancing each bone, cell, fibre, muscle and nerve. Breathe deeply into the colour and take stock of your feelings, you could experience a sudden shiver, a softening of your heart. You could perceive your Angel enfolding you in his wings. State your case, do not be afraid, an Angel’s mission is to protect and guide you. Imagine how your life would be if you did not have your problem. Then ask your Angel to give you a word, a feeling, a sign to guide you to a positive solution. Take note of any emotions or bodily sensations, remember symbols or images given and draw them or write them in a special Angel diary later. Stay with your Angel as long as you want to, allow yourself to experience whatever sensation emerges till the colour fades and the door closes. Thank your Angel, sure that a resolution to your problem will be found. Slowly breathe your way back into everyday reality. Over the next few days watch for signs. You might pick up a White feather. A friend could call with inspiring advice. Synchronistic events will occur, for example, you could bump into someone who will help you find a solution to your career problem. In other words, as you trust that everything will turn out right with time and patience, as you believe in your Angel with faith in a positive outcome, that outcome happens! So expect a miracle!